Right in the middle with the is mombubot score of 5. This site's home page has the number 1 listing and this page from the site as you know sits at position 11. Quite good positioning for the pages on this site. Let's investigate a little more about this page. Well it who says Microsoft Word doesn't create good HTML. This page was generated by Microsoft Word 11. It is missing some key HTML SEO best practices such as Description and Keyword meta tags and there are no uses of the keywords in the image or header tags, but it still ranks well. Okay why does it rank? Two best practices stand out first: the keyword in the domain and the keyword in the title. But the ranking of the number one page will also pull this one up. 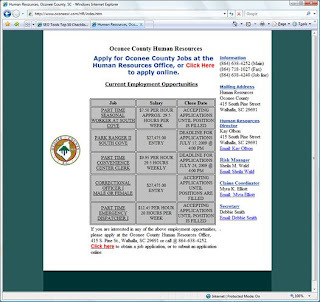 The one thing to note especially on this page is that it is a current employment listings page. This implies that this page is updated on a regular basis with new listings. In fact, based on the page data this page was created back on 2006, so it has been around for some time and it was updated today. Fresh content on an old page certainly helps with providing relevant fresh content and relevant fresh content is a search engine best practice. A number of factors come into play with this page but the relevant fresh content certainly helps with the ranking. How often do you add good new content to your site?